Scott, international conservation director for the nonprofit Conservation Northwest, has been passionate about large predators for as long as he can remember. So when state legislators introduced that bill, preventing wildlife officials from bringing in new grizzlies to augment the state’s rapidly dwindling population, Scott was outraged. A grizzly in Yellowstone National Park. Credit Kim Keating / USGS. To others, though, the idea of bolstering grizzly populations is dangerous — and contentious. A proposal to reintroduce bears to Montana’s Bitterroot Mountains in 2000 spurred death threats, and a biologist who suggested bringing new bears to help the population of Washington’s North Cascades was spat on at a public meeting. Now, under the law that Scott testified against, Washington wildlife managers are encouraged to support grizzlies’ “natural regeneration,” but barred from transplanting or introducing them. So will grizzlies ever regain a foothold beyond Yellowstone and Glacier national parks? This summer, they may be gaining ground: As federal officials move forward with a plan to delist the grizzly in the Yellowstone area, other parts of the West have seen a reinvigorated effort to restore the bruins. In June, the Center for Biological Diversity filed a legal petition with the U.S. 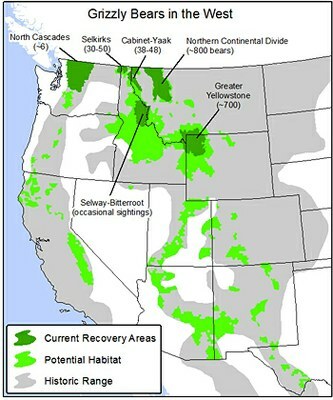 Fish and Wildlife Service and Department of the Interior identifying 110,000 square miles of habitat in New Mexico, Arizona, Utah, Colorado, Oregon, California and other places where the bears once roamed and where recovery projects could be implemented. Shortly after, the San Francisco Chronicle ran a story imagining grizzlies roaming the Sierra Nevada; one proprietor likened the idea to "bringing back Tyrannosaurus rex." Grizzly bears' historic range, current range and habitat identified by the Center for Biological Diversity as suitable for grizzly recovery. 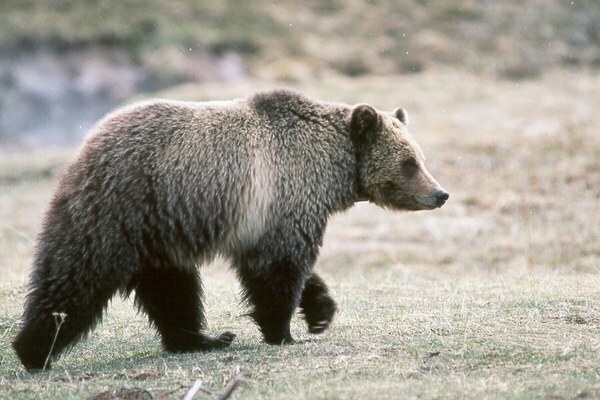 Only once before have biologists successfully overcome public opposition and augmented an endangered grizzly population: In 1993, a crew captured a female in British Columbia and released it into the sparsely-populated Cabinet-Yaak mountains of Montana and Idaho. Though the bear managed to birth nine cubs before she was shot by a hunter in 2009, her story illustrates the challenges that bear recovery efforts face in a landscape peppered with human activity. Even wildlife advocate Erin Hauge writes that reintroducing bears to the Sierra Nevada is overly ambitious, given the threats of climate change, habitat encroachment and human encounters. Grizzlies back from the brink?